Moments of My Life: Floating Bed, Safe or Not? Floating Bed, Safe or Not? 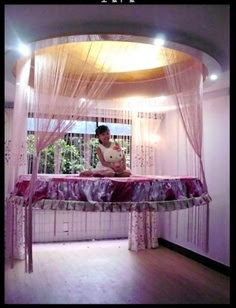 Love this beautiful floating bed with pretty lace designs all around it, pretty unique! I've been used to seeing the usual bed for kids with cute beddings and soft pillows all around but it's usually placed beside the wall for safety purposes. Well even I did that when my girls were still young. I prefer to place their beds beside the wall so it will add up as extra support when they suddenly stand up after waking. Now seeing this floating bed made me realize that not all people fears falling off the bed. Anyway we all have our sleeping habits and some I should say are careful enough not to slide or fall when sleeping. I'm talking about adults as I really can't imagine kids sleeping on this floating bed, maybe if they have companion who will watch over them while they sleep. Trust my mother instinct to always think that something might happen if kids are allowed to be in a not-so-safe position.